Don’t you want to be rich? Honestly, I do and, I never met one who doesn’t. I never met a sage, that could be the reason. In everyday life I come across people working day and night to be rich. To be able to earn money and feel secure. Unless you resigned to your fate or, you are already rich, I bet you want to be rich. It’s a goal you should say out loud. I WANT TO BE RICH ONE DAY!! Then why only 1% of us are rich? There might be many reasons but the most significant one is not having enough urge. The same way I want to be able to compete in half marathon and finish it without stopping, but every time I end up taking several breaks in between to finish. It is the lack of enough will. I don’t want it hard enough! I want to be rich but, I don’t want it hard enough. I want to have a million dollar in my investment account but I am struggling to reach $500,000. The largest proof that I don’t want hard enough is the fact that I recently bought a home larger than what we needed. That we bought expensive vacation twice last year, ignoring budget vacation options. Can you relate to your life? Did you ever try to control your spending thinking about your future, while money was there to spend? 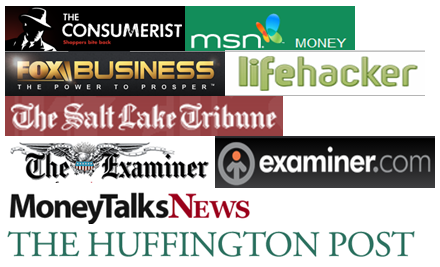 Did you always opt for cheaper alternatives? When you tried, probably you gave in to others, to your partner, your children or friends. You probably wanted to celebrate your anniversary frugally but you had to give in to make your spouse happier. You probably better off contributing to your child’s college saving fund rather than buying him an iPhone. But the instant need is to have an iPhone, so comes another iPhone in your home. The need of delayed gratification. Delayed gratification is a practice, where you postpone your happiness now to become happier in future. This is tough job and only a few can master. This is the main reason we are not rich where as some one else is richer. Unless you really materialize a brilliant marketable idea, most rich persons became rich by investing their money and time in money earning opportunities. They are the master of delayed gratification. As per the definition – Delayed gratification, or deferred gratification, is the ability to resist the temptation for an immediate reward and wait for a later reward. Generally, delayed gratification is associated with resisting a smaller but more immediate reward in order to receive a larger or more enduring reward later (wikipedia). Mastering delayed gratification is a very difficult task. No wonder only a handful of people are rich in this world. Numerous experiments were conducted over little children and adult beings. Instant gratification is in grained in our minds and perhaps our genes. Inherently most of us seek instant gratification and that seriously limits our ability to grow money further. Ever read the book “Rich Dad, Poor Dad”? So, in practice what delayed gratification does look like? We want everything we see other people having. be it a t-shirt or dining out at most expensive restaurant. If your neighbor leads an extravagant lifestyle we tend to follow, we want to keep up with them. The sole purpose of living becomes spending your money buying stuff. We don’t want to think about a possible income disparity between us and our neighbor. Delayed gratification means not to fall in to the trap of showing off, delayed gratification means you take concerned decision at every buying step and, if possible, postpone the spending for better future alternatives. Delay gratification means driving your 10-year-old Honda to buy a BMW 10 years from now, just because your finances doesn’t support a brand new BMW, at this time. Taking on debt for a depreciating asset is not something rich people generally do. In very simple language, don’t buy things on credit card unless you can pay it off in full, before they are due. I may keep the home purchase situation out as buying home is an important financial decision and in most likelihood home buying involves buying an appreciating asset. Delayed gratification doesn’t mean being cheap, it means buying value. Whether it’s buying a car or a TV set or a particular stock. The money you save for future can only grow and buy you more stuff if you buy a valuable investment. Be it a rental property or a mutual fund or even a piece of fine art. Whether you buy a distressed home which after fixes sells at a profit, or buying a used car which will run well for years to come and thus save you from trouble and money.=, at the same time will depreciate slower than a new car. Buying value may also involve investing in stocks that appreciate and increase your net worth. Saving alone will not make you rich unless you invest it wisely. 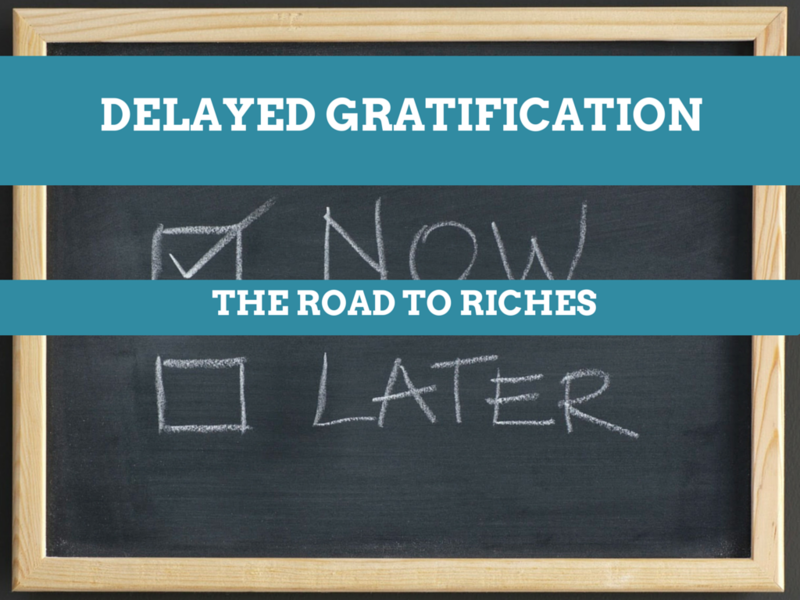 Delayed gratification is one of the most traveled path to the riches. Delayed gratification gets you to the point where you can have the things that you want in future, when you need them. And it is because you put off getting them until now, when you don’t really need. So, it’s a trade-off. Master the technique is a very difficult job. It will test your patience and will-power to the extreme. At time it may make you look stupid in front of others. You may see unhappy faces at your home, so it’s a damn difficult job to continue practicing delayed gratification. Once you make up your mind and take the buy-in from your family, try delayed gratification technique today. Don’t spend even a single dollar unnecessary, and keep it aside for future. For some, seeing money grow brings more gratification than by using the things it could have bought. There’s very few things which we absolutely needed now, we already have most of the things that are necessary. So now is the best time to start delayed gratification. Start today! Practicing delayed gratification can be difficult at times but is necessary in achieving financial freedom. Positive affirmations are critical so I am glad you mentioned saying it out loud. Laura, thanks for your comment! The other thing I should have mentioned is that practicing delayed gratification often lead us to fail but we should never stop trying. And failures are not bad as long as you stick to the goal. I think this was the hardest lesson I learned when my family got serious about finances. In fact, it is something I still sometimes struggle with. Thanks for the encouragement!